Thousands of people rallied in Caracas, Venezuela, on March 4 as part of a rally organized by opposition leaders to support Juan Guaido’s return to the country after meeting with leaders in the region. Guaido, defying President Nicolas Maduro’s travel ban, left the country to hold meetings with regional leaders, including Brazilian President Jair Bolsonaro, President Marito Abdo of Paraguay, Argentina’s President Mauricio Macri, and President Lenin Moreno of Ecuador. 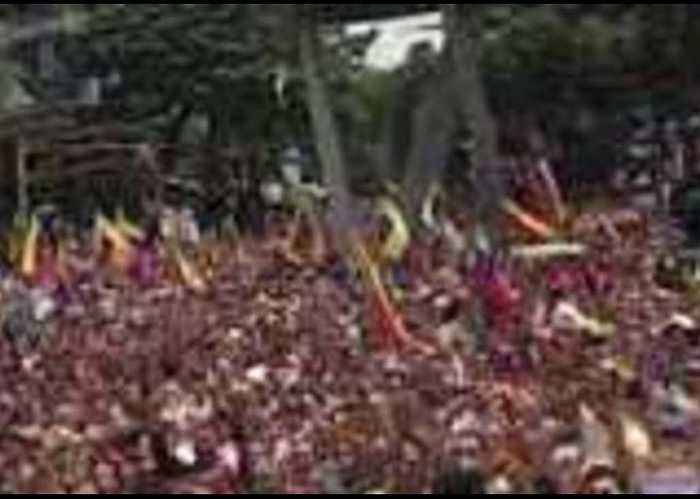 This footage shows crowds gathered in Alfredo Sadel Plaza in Las Mercedes, an area of Caracas, singing Venezuela’s national anthem along with Guaido and other opposition leaders.